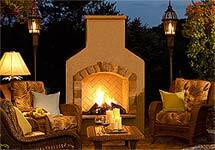 An outdoor wood burning fireplace has become more popular than ever. They are a smart purchase for your backyard, patio, or pool area, as they can be used virtually year round. From providing a source of heat in winter, to being the centerpiece of your outdoor room while entertaining in the summer, these fireplaces are as versatile as they are beautiful. The burning wood’s smoke also helps to ward off insects, a big plus in warm weather. Many people who are in search of wood burning fireplaces to compliment the living space outside of their home find it a bit difficult to choose just the right one. There are many styles and options to consider when choosing such a fireplace, and they are all so tempting that you may try to convince yourself that you need more than one! Don’t let all of the choices you are faced with overwhelm you. Instead, do a little homework and discover the types of fireplaces that would be both suitable and safe for your yard. Narrowing the selection down a bit can make it easier to decide on the perfect fireplace for you. They are available as custom made or free-standing. The custom made fireplaces look and perform very much like a fireplace that you would have inside your home. About the only difference you will find in these outdoor models is the lack of a damper. You can choose an outdoor fireplace crafted of brick, or of various types of stone such as marble, granite, sandstone or stucco. Of course, these wood burners have a chimney, and you can also choose to include a mantle. These fireplaces come in a kit for the homeowner to assemble, or you can hire a contractor to do the job for you. Those who are fond of do-it-yourself projects can also purchase fireplace plans, and build a beautiful fireplace to be proud of. The kits come with detailed directions, and the careful following of these will assure you of creating your own fireplace masterpiece! Building a fireplace yourself from scratch naturally takes longer, so if you are in a hurry, one of the fireplace kits can save you both time and money. If you don’t think you want to add an accessory that is as permanent as a custom made fire place to your yard, you still have many different types of outdoor fireplaces to choose from that can be portable. There are several that can travel from backyard to beach to campsite and back, and perform in each spot beautifully. You may also have a small outdoor area to work with, and prefer a fireplace that won’t overwhelm the space! Also known as fire pits, fire bowls, and chimeneas, free standing outdoor wood burning fireplaces are an affordable way to create the kind of ambiance that only an open fire can bring. They are a popular attraction at parties and other gatherings, and you’ll find that everyone wants one of the coveted fire side seats! Many people use them not only for insect control and/or a source of heat, but also as a fine way to cook food outdoors. Outdoor wood burning fireplaces can cook your meats and vegetables as well or better than conventional grills. Free standing, portable fireplaces are made of terra cotta, cast iron, terrazzo tile, steel, copper, and other materials. The fire pits and bowls usually come complete with a stand that is made from good quality wrought iron. They also include a poker, a steel grate, a spark arrestor screen, and some have an ash collector bowl to go underneath the fireplace that minimizes any mess. The size range on these can range from 30 inches all the way up to 36 inches, with the bowl of the pit becoming deeper as the size grows. Portable fireplaces can be very decorative as well. Some free standing ones have various designs cut out of the sides of the pits, and these can create lovely shaped, dancing shadows that add a touch of whimsy to your evening. Just about everyone loves to relax by sitting around an outdoor fire, and with wood burning fireplaces, you can bring this mood to your backyard whenever you like. The cast iron and stainless steel varieties of portable fireplaces are extremely durable, and can withstand the heat of many, many fires. You will get many years of pleasure from a fireplace made from one of these materials. They are much more stylis these days, and hopefully you will be able to find one that suits your needs perfectly.